CAR RADIO UNIVERSAL FLEXIBLE ANTI NOISE BEE-STING AERIAL ARIEL ARIAL ANTENNA 9"
Be sure to clean and dry your car and then stick the fin on the surface. This antenna is functional and intended for AM/FM radio signal. 1 x Car Radio Antenna. We will response you within 48 hours and 100% promise to solve it for you. Car radio shark fin antenna signal for VW Polo Ford Kuga Chevrolet Cruze Nissan qashqai Peugeot Toyota Rav4/Corolla Opel Mokka. Included: 1 Car radio shark fin antenna signal for VW Polo Ford Kuga Chevrolet Cruze Nissan qashqai Peugeot Toyota Rav4/Corolla Opel Mokka. 1 x Car Aerial. We will reply you ASAP. Color: Black. 1x CAR AERIAL. Skoda models Notice: The reception may vary for original VW radios. Replace OEM Roof Antenna. For :VW MK4 Golf / Jetta / BORA, Passat 3B / 3BG; B5 / B5.5, LUPO, Polo 6N2 / 9N, New Beetle, SHARAN 00-04, T4 96-03. This is a replacement part for your antenna, it can enhance the signal and achieve the purpose of decoration.This Shark Fin Antenna with FM/AM connection cable inside. Features: Easy Installation / No Drilling Required. Make your car cool and distinctive. Durable, classic, handy and beautiful. Style : Shark fin, streamlined design. Size:As the picture shows. Color:Carbon Fiber Material : High-Quality ABS Material Fitment: Universal Fit for Cars NOTE: If the size of your original antenna's base is bigger than the dimension in the picture, this shark antenna will not fit your car. Be sure to clean and dry your car and then stick the fin on the surface. This antenna is functional and intended for AM/FM radio signal. 1 x Car Radio Antenna. Be sure to clean and dry your car before stick on it. Genuine Smart Fortwo (451) (450) Aerial Antenna Base A4518200675 NEW! Genuine Smart Fortwo Aerial Antenna Base P/N A451 820 06 75. Suitable For All Smart Fortwo (450 / 451) Models. 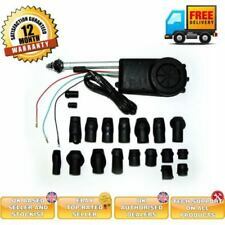 Car Van Internal Electronic Amplified Antenna Stereo Radio FM Aerial Universal UK Seller. 1 x BMW Style Dummy Shark Fin Antenna With Decoration LED Light ( NOT Real Light ). Also note that monitor settings may vary from computer to computer and may distort actual colors. Easily Installed By Stick It On Car Surface With Pre-Applied Adhesive Tape. ABS Plastic Roof Style Shark Fin Antenna Radio Signal Aerials For Most Cars. 1x Shark Fin Antenna. Fit for BMW and most of cars. Size(approx.). : 17x 7.6x 6.5 (LxWx H ). Simple user instruction and easy to use. Applicable models: For Peugeot 206 207/Citroen/Fukang C2. 1 x Antenna Pedestal. Material Type: ABS. Due to the difference between different monitors, the picture may not reflect the actual color of the item. UK Car Vehicle Shark Fin Roof Antenna Aerial FM/AM Radio Signal Universal Trim GreyD. -This shark fin antenna with FM/AM connection cable inside. Item type: Car Antenna. -The design is amazing, concision and modern. Style : Shark fin(Shark fins, streamlined design makes the car more beautiful). This Shark Fin Antenna with FM/AM connection cable inside. 1 x Shark fin antenna. The design is amazing, concision and modern. For :VW MK4 Golf / Jetta / BORA, Passat 3B / 3BG; B5 / B5.5, LUPO, Polo 6N2 / 9N, New Beetle, SHARAN 00-04, T4 96-03. 1x CAR AERIAL. Replace OEM Roof Antenna. PASSAT 3B/B5. PASSAT 3BG/B5.5. BORA / Jetta MK4. 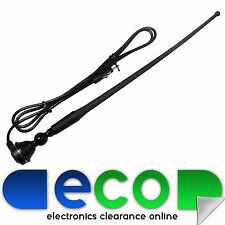 Black roof aerial antenna with spiral coil. -Just screw it on the roof aerial base. -The antenna is with 6mm innear hole. - Length: 40 cm. 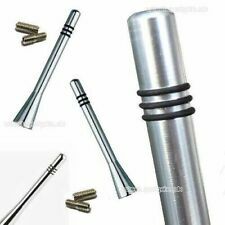 Mast length: 360mm. 1 x Car Aerial. Single Rubber Section. Quantity: 1 piece. Color: Black. 1 x Carbon Fiber Car Radio Aerial Antenna. 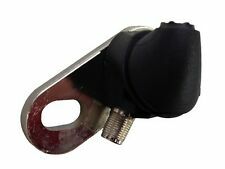 This is an antenna that universally fits for most of the car models whose origin antenna is capable of being dismantled and re-installed, such as VW, Audi, Toyota, Honda, Mazda, Chevrolet, Ford, Mini MINI, Nissan, Mitsubishi, etc. Car Vehicle Shark Fin Roof Antenna Aerial FM/AM Radio Signal Universal Trim Grey. Carbon Fiber Look Shark Fin Aerial Antenna Roof AM FM Radio Signal For BMW VW UK. Carbon Fiber Car Shark Fin Roof Antenna Radio FM/AM Decorate Aerial Fit for BMW. The base is designed with a single coax connection with a RAKU 2 type connector. CAR AERIAL x1. Skoda models Replace OEM Roof Antenna. For :VW MK4 MK5 Golf / Jetta / BORA, Passat 3B / 3BG; B5 / B5.5, LUPO, Polo 6N2 / 9N, New Beetle, SHARAN 00-04, T4 96-03. (2) On your Car - simply push directly onto the end of your aerial personalising your car;. electric aerials. The Wild Camping. 1 pcs antenna ball. Will fit virtually all car / van aerials up to 7mm thick but are NOT suitable for. 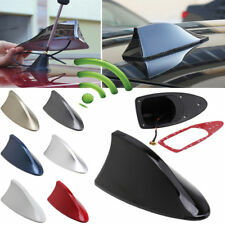 New Universal Car Shark Fin Roof Antenna Radio FM/AM Decorate Aerial Blue. 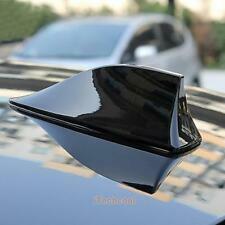 Black Shark Fin Antenna FM/AM Car Shark For Corsa Vauxhall Audi Aerial Radio UK. Style: Shark fin (Streamlined design makes the car more beautiful). 7: Style : Shark fin(Shark fins, streamlined design makes the car more beautiful). 3: This Shark Fin Antenna with FM/AM connection cable inside. 1x Shark fin antenna. 5: The design is amazing, concision and modern. This latest model in our range of DAB aerials is designed to receive signals even in areas that don't have optimal DAB coverage. DAB Aerial For the Pure Highway Car Radio Magnetic Base 19.6 cm High Gain 4m cable. Car Radio Antenna Signal Amplifier Booster. 1 x Antenna Amplifier. Great reception and Clearer radio. Red wire connects to power antenna lead or 12V source. Compatible with ALL AM FM stations. Improves signal concentration. Material: Aluminum Carbon Fibre. 1 x Carbon fiber antenna. It also fits most vehicles with screw-on type antenna base. No modification. Include: adapters in 4 common sizes. Bottom width: 1.5cm. OE: 28216BC20A. L 1769CC l4 GAS DOHC Naturally Aspirated 2002. For Nissan Micra Comfort Hatchback 4-Door 1.4L 1386CC 85Cu. l4 GAS DOHC Naturally Aspirated 2007. l4 GAS DOHC Naturally Aspirated 2006. l4 GAS DOHC Naturally Aspirated 2005. Car radio antenna lets you listen/receive more information while traveling. 1 x Car Radio Antenna. Antenna Housing: L B H: 11.5 2.2 0.6cm (4.53 0.87 0.24in). Anyway we will try our best to avoid this kind of thing. Roof Aerial Antenna Base Gasket Seal. We will endeavour to replace any incorrect or faulty tem as fast as possible. Class service. 1 x Car Aerial. Screw Length: 15mm. Base hole: 6mm. 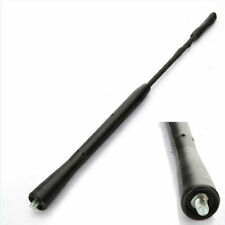 Universal Carbon Fiber Look Shark Fin Aerial Antenna Trim Cover Decorate. 1 x Shark Fin Antenna Trim Cover. -Type:Shark Fin Antenna Cover. -Style: Shark fin. NOTICE: Just a Cover ONLY, NOT REAL ANTENNA, for decorate only! With Radio antenna function. 1 x Radio Antenna. Easy to install, just stick it on the car surface. Suitable for all cars. What is included. Bring back glue for easy installation, can be directly stick on front or rear windscreen of your car. 1 x Car Radio Aerial. This product lantern plug is plug and play. 3M glue is glued to the glass, and can be pasted in the outdoor room. 180cm Universal Car Antenna Adapter Extension Cable Male to Female for Radio AM/FM. 1 Car AM FM Adapter Cable. Transmission Type: FM AM. Easy to use: plug and play. Color: Black (As Pictures Show). Made of EVA, lightweight and no easy color fading. Material: EVA. Multifunctional decorative ball, can be used to stick on car antenna, and can be used to decorate a pencil or pen as well. Apply to Car Type: Universal. Style: Shark Fin. Color: Black. Sturdy antenna with the weather resistance. Screw it in the antenna base. Plug and Play. for BMW M3 Convertible--- 1998~2006. for Toyota Yaris Hatchback--- 2007~2010. for Toyota Solara Convertible --- 2004~2008. (2) On your Car - simply push directly onto the end of your aerial personalising your car;. electric aerials. 1 pcs antenna ball. Will fit virtually all car / van aerials up to 7mm thick but are NOT suitable for. Radio frequency: 88-108MHZ. output impedance: 75 ohms. output standing wave: less than 3. output line length: 3~5m. storage temperature: -40 C, 80 C. ambient temperature: -35 C, 75 C. gain: UHF22 3DB VHF25 3DB. Flexible enough to be stretched over the aerial base and the lip seal pressed in between the aerial and roof. 2 x Aerial Rubber Gasket Seal. Fit many style aerials which are positioned on the rear of the roof except those which are significantly larger, longer or a more elongated-oval shape, or larger and more rectangular. 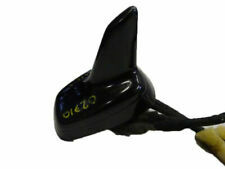 Black Shark Fin Antenna FM/AM Car Shark For Corsa Vauxhall Audi Aerial Radio UK. Carbon Fiber Style Shark Fin Aerial Antenna Roof AM/FM Radio Signal For Audi BMW. 1 x Carbon Fiber Car Radio Aerial Antenna. Electronic Stereo Radio Hidden Amplified Antenna Kit. 1 x Radio antenna. Input: Thoroughfare / Output Impedance: 750HM. To the USA. To Other Cou ntry. Line long:1.5m. Ground independent. Small and sleek so you can stick it anywhere in almost any vehicle. Style: Shark fin (Streamlined design makes the car more beautiful). If the size of your original antenna's base is bigger than the below size, this shark antenna will not fit your car. It can enhance the signal and achieve the purpose of decoration, let your car more brilliant. Product Name: Car Radio Antenna Plug; Material: Plastic,Metal Fits all car radios and related accessories antenna ports. AM/FM Cable Connector features solder type, easily connect and provides good quality signal transfer. " 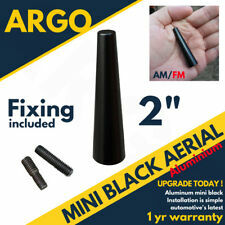 Color: Black,Silver Tone; Package Content: 2 x Car Radio Antenna Plugs" Dimensions: 6.5 x 1.5cm/2.4"" x 0. This is an inexpensive and attractive looking front roof aerial in black with a round (slightly oval) base. The aerial has an industry standard 5 mm male thread fitting on the underside of the base, and a plastic locating peg, although the plastic peg is easily removed if is not required or does not align with an existing locating hole. On your Car - simply push directly onto the end of your aerial personalising your car;. You can also pop your ball on the end of your pencil. Making it much easier to find in that crowded car park. IWe will reply you ASAP.